We began with a simple example, counting together the number of vertices, edges and regions. For counting the regions, I emphasized that we count the “outside” region as one of the regions. 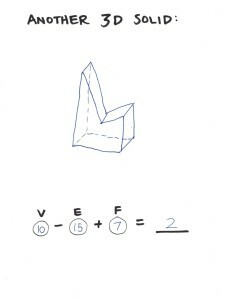 Then, I injected a little mystery by mentioning that Euler had discovered something peculiar about calculating $V-E+R$. Could they find out what it was that he had noticed? Each student had her own booklet and calculated the Euler characteristic for various small graphs, as I moved about the room helping out. Eventually, the girls noticed the peculiar thing — they kept getting the number two as the outcome! I heard them exclaim, why do we keep getting two? They had found Euler’s delightful surprise! With the students, I suggested that we try a few somewhat more unusual cases, to see how robust the always-two situation really was. But in these cases, we still got two as the result. The girls made their own graphs and tested the hypothesis. 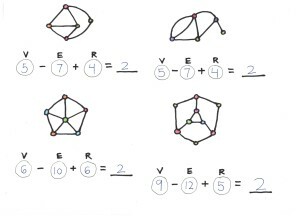 Eventually, of course, I managed to suggest some examples that do in fact test the always-two phenomenon, first by looking at disconnected graphs, and then by considering graphs drawn with crossing edges. 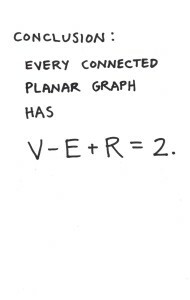 In this way, we were led to refine the $V-E+R=2$ hypothesis to the case of connected planar graphs. Now, it was time for proof. I was initially unsure whether I should actually give a proof, since these were just third-graders, after all, and I thought it might be too difficult for the students. But when the teachers had expressed their desire to know why, they had specifically encouraged me to give the argument, saying that even if some students didn’t follow it, there was still value merely in seeing that one can mount an argument like that. Excellent teachers! 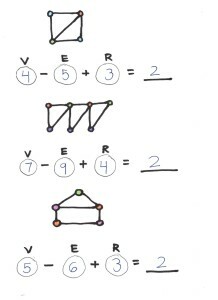 The idea of the proof is that $V-E+R=2$ is true at the start, in the case of a graph consisting of one vertex and no edges. 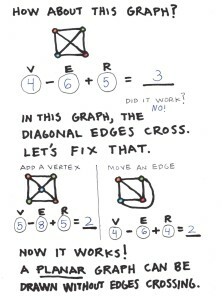 Furthermore, it remains true when one adds one new vertex connected by one new edge, since the new vertex and new edge cancel out. Also, it remains true when one carves out a new region from part of an old region with the addition of a single new edge, since in this case there is one new edge and one new region, and these also balance each other. 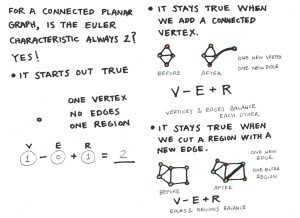 Since any connected planar graph can be built up in this way by gradually adding new vertices and edges, this argument shows $V-E+R=2$ for any connected planar graph. This is a proof by mathematical induction on the size of the graph. 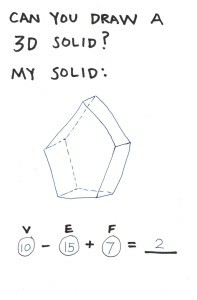 Next, we moved on to consider some three-dimensional solids and their surfaces. With various polyhedra, and the girls were able to verify further instances of $V-E+R=2$. In the end, each child had a nice little booklet to take home. The images above are taken from one of the students in the class. 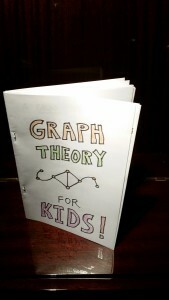 You can find a kit of the booklet here: Math for eight-year-olds: graph theory for kids! 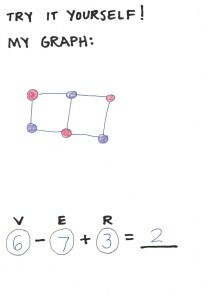 See also the account of my previous visit: Math for seven-year-olds: graph coloring and Eulerian paths. 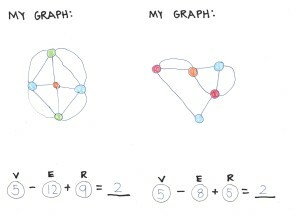 This entry was posted in Math for Kids and tagged Euler characteristic, graph theory, kids by Joel David Hamkins. Bookmark the permalink. Maybe it’s time you collect these into “Math for children, that adults can enjoy too!” (because surely next year you’ll have a post about math for nine year olds, and so on). 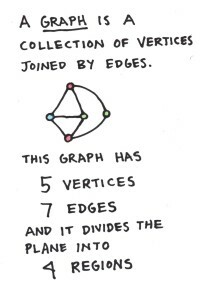 The topics could cover basic graph theory, perhaps very rudimentary explanation about Hilbert’s grand hotel, basic Ramsey theory or other combinatorics. If you use a font which looks like crayons, and nice colors, it could really stick. Thanks for the vote of confidence! In fact, I’ve had just such plans — let’s see whether I can complete it before the kids are teenagers! That is pretty awesome. The drawings are great, too! 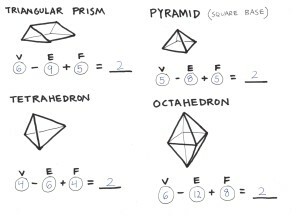 I wish every concept of math was available in this format – easy to grasp. I had a question: for the 2D case, the “outside” was counted as one of the regions. For the 3D case, why wasn’t “outside” considered?? If you think about the case of a cube, say, then you can imagine puncturing one of the faces and stretching the cube out so that it lays flat in the plane. The face that you punctured becomes the “outside” region upon doing that. The same is true for all the other polyhedra that we considered — you open up one of the faces and lay the whole thing completely flat, so that the region you opened up becomes the outside region in the plane. 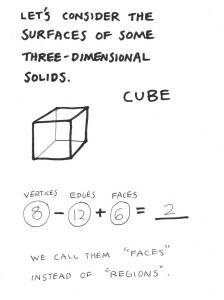 One can also imagine the cube drawn on the surface of a sphere, in which case any one of the faces can be viewed as the “outside” region. It is interesting to consider the Euler characteristic for polyhedra that form a torus (like a donut) or more complicated shapes. You no longer always get 2 in these more general cases. Yes, I think this kind of mathematics is appealing at any age! These make me happy. thanks. Thx. I print this right now for my two doughters. Is a PDF of this available, like for your chromatic numbers class? Yes, I mention it at the end of the post. You can find it at: https://plus.google.com/u/0/+JoelDavidHamkins1/posts/46ZctASr5US. I’m glad to hear that you enjoyed it! I think it is good for any age. I should have called it, Math for eight-year-olds at heart! Or eight-to-eighty-year-olds, or….? This is absolutely wonderful. 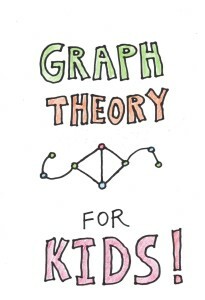 I have been convinced for some time now that graph theory is accessible to kids starting at a young age – what a shame that most kids don’t get to encounter it! 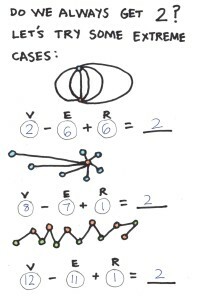 Here is a post about me introducing a (very basic) graph theory concept to my daughter when she was 4 https://aofradkin.wordpress.com/2013/08/07/graph-theory-with-dolls/ . She is now 6, and I haven’t done too much follow-up graph theory. This post might have just inspired me to come back to it! 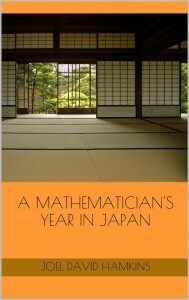 For a translation into Italian, see Annarita Ruberto’s blog http://www.lanostra-matematica.org/2015/05/la-teoria-dei-grafi-per-i-piccolie-non.html. Thank you so much, this is just what I was looking for. 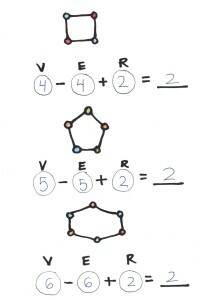 My son (age 9) has come across the Utilities problem (probably because I gave him How Long is a Piece of String to read by Eastaway and Wyndham) and wanted to know WHY K_3,3 isn’t planar (although he didn’t phrase it that way). 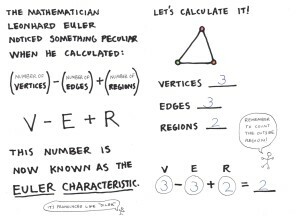 My Graph Theory is a little rusty, so I was searching for some accessible material I could go through with him and found this, which is spot on, as once we have established Eulers formula he will easily be able to apply it for himself to see why. (As an aside, I’ve never come across someone suggesting giving one house water access by having it’s own well in the garden before, I found that quite creative). 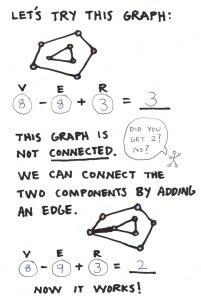 I will use the graphs (with reference to your web page) in a popular talk for students. Thank you for this, I would never be able to come up with this by myself. I don’t know if you are aware but your document is on Google+ and now the booklet is no longer available. Would you be able to make this available as a pdf please? I was gutted when I went to download this and couldn’t. I would really appreciate it if you could find time. Thanks. Ah, I hadn’t anticipated that Google would ever shut down G+. I’ll try to upload it here later. Thanks for the appreciation!